Last week’s #Made4Math entries were great fun to read. I love how all us teachers get so excited about the new school year during the summer and start acting like little kids. An aside: many of us seem to also harbor some kind of office supply addiction. This week, I recreated one of my favorite items from the school year: my Student Center. This idea came from my dear friend and colleague, Joie Bullock. Why you need a Student Center: 50 times each class, “Can I have a piece of tape? Can I use your stapler? Can I? Can I?” You stop what you’re doing, rummage through your desk, and hand it to the kid. OR, you actually keep this stuff out for kids but it’s always messy and out of supplies. The Student Center is as much an organization scheme as it is a spot to keep office supplies out for kids. I decided against putting out pencils & the cap erasers I keep around because in my old classroom, they’d all disappear during the first block of classes. You’ll want one Student Center for every 15 kids in class, give or take. 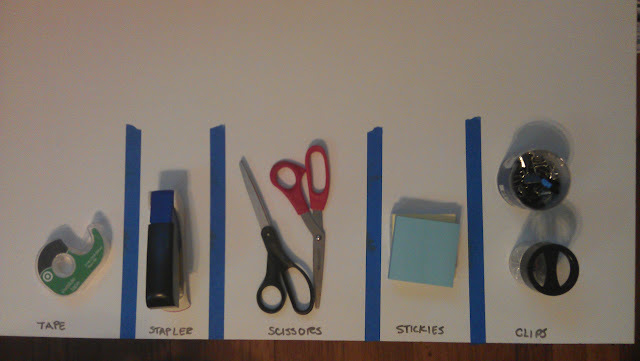 Want to see more creative classrooms from high school math teachers? 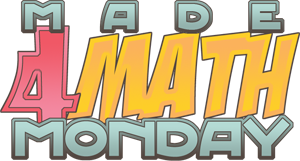 Peep the latest #Made4Math tweets and this week’s curated entries. This is totally on my to-do list 🙂 Thanks so much for sharing! I’ve used a student center for a few years – post upcoming events / lunch menu / NTK info there as well – keeps kiddos away from “my space” – love the idea of fun duct tape Julie! Megan – do you have student centers in different spots of the room? You’ve got some items I never thought about including – great share! Thanks!